Panamanian fry bread treads the line somewhere between a New Orleans beignet and a fritter. Unlike a traditional American doughnut, hojaldras are made without yeast and can be consumed in one or two bites. Dusted with powdered sugar, they are a tasty breakfast accompaniment to a steamy cup of Panamanian coffee. Preparing the dough is the most time-consuming part of making hojaldras. If you don't want to get up two hours before breakfast, make it the night before. In a large glass bowl, combine the flour, sugar, baking powder and salt. Make a well about the size of half a grapefruit in the middle of the flour mixture. In a small bowl, whisk the milk, 3 tablespoons of oil and the egg. Pour the mixture into the well, stirring in with a wooden spoon as you go along. Knead the dough until it turns into a ball that doesn't stick to the sides of the bowl. 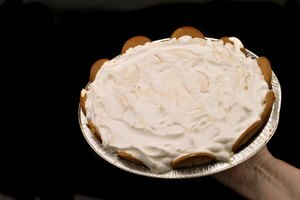 If it's too sticky, add a little bit of flour. If it doesn't stick together, add a spritz of water. Once the dough has formed a ball, turn it out on a floured board or sheet of wax paper on the counter. Knead until the dough is elastic and soft. Wrap the dough in plastic wrap and put it in the refrigerator for a least two hours. 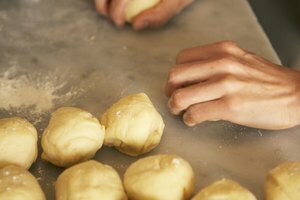 Remove the dough from the fridge and roll it by hand into a long rope about 2 inches in diameter. Heat oil to a 2-inch depth in a large straight-sided skillet. Oil is ready when a pinch of dough sizzles and bounces immediately to the surface. Pinch off 1 1/2-inch sections of dough and flatten them to your desired size. Some cooks like to flatten them thin then roll them up, but that method tends to retain more oil. Drop the dough into the oil and wait for the pieces to rise to the surface, about two minutes. Note cooking time, turn the pieces over and cook the other side. Drain the hojaldras on brown paper. Sprinkle with powdered sugar and serve. *If you've not made hojaldras before, run a test before making a whole batch. *If you are lactose intolerant or calorie conscious, use water instead of milk. *For a richer dough, substitute melted butter for oil. Instead of toast, top plain hojaldras with a fried egg and strip of bacon. Serve with hot coffee and mango slices. Roll the dough into longer sticks, fry them and roll in cinnamon and sugar. Omit the sugar and add a little aji chombo sauce and black pepper to create savory hojaldras. Roll in coarse salt like a pretzel.